Milan: San Siro reborn or new stadium? It might be a thorough redevelopment of the existing stadium, including capacity decrease. It might also end up being a brand new stadium, though. Either way, Milan and Inter both claim they're stronger together and will stay co-tenants. Last week AC Milan and FC Inter released a memmorandum of understanding regarding their “willingness to work together on the project for a modern, state-of-the-art stadium”. It was commonly understood to mean a revamp at Stadio Giuseppe Meazza. And not without merit, especially when this interpretation was fueled by news from Corriere dello Sport, claiming the two teams might reach an agreement with the city. It would mean giving them a 99-year lease of the stadium and green light to carry out alterations much greater than the recent creation of new premium seating. 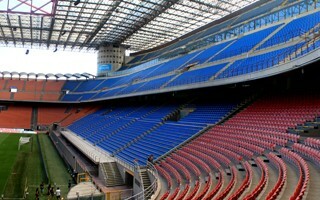 The Corriere article suggested San Siro could lose its third seating level, leaving capacity at around 60,000. Topping the two remaining levels, there would be new private boxes to generate extra revenue. And it seems to make a whole lot of sense, even if Inter are on a high with almost 63,000 people per game this season. However, it's not even close to an official vision at this point. As of now the only thing we may be sure of is the willingness of both Serie A clubs to build together. But what would be built, remains to be seen. San Siro requires immense spending to see lifespan extended by further decades and it's not just about capacity. After all, the building's layout reduces available floor space greatly, to the extent that official museum had to be established in a temporary pavilion outside. „With more games every week between the league and cups, the visibility would be crazy. The stadium increases revenue by €40-50 million a year and a great sponsor could give it the name, we would have a queue of international companies interested in such investment. And we will get a lot more than what they do in Turin with Allianz.” Scaroni boasts. First meetings with the city administration took place just days ago, further are expected in December. That's also when we should know the preliminary analysis evaluation.